It is a lot of fun photographing the single men fight for the garter during the wedding reception. Generally, the alcohol increases the guys energy and the garter toss can become an interesting affair. Often, it is not about the garter but rather about to the guys ego so they fight tooth and nail for the precious piece of the beautiful bride's garment. 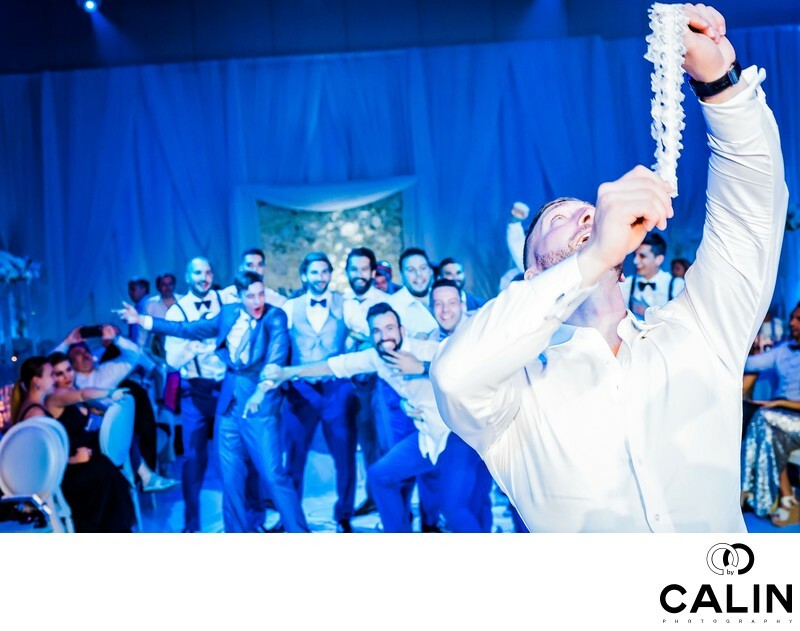 In this perfect wedding photo, we can see the guys in the background for each other so that they get a better spot to catch the garter. In the foreground the groom is looking ready to throw the desired object. In this wedding I took a picture of the groom then I moved behind him to capture the fight between the guys a fraction of a second before one of them caught the garter. Once that happened, I pulled my business card and gave it to him and we all started laughing. I find that wedding photography is not only about capturing the beautiful moments in the love but also about immersing yourself in the big day and enjoying it with passion. That definitely helps one's work in a similar fashion like the actor identifies with the character. To take this photograph I used a Canon 5D Mark three camera equipped with a 35mm lens. To create a beautiful light in this image I used an on camera flash, namely the Canon 600 Ex-RT shots in manual mode. I shot this picture at F5.6 so that the groom and the boys are in focus.